Spa treatments are great ways to rejuvenate the body and spirit and provide a short but relaxing break from your hectic everyday life. If you are interested in a facial treatment or massage, a regular spa is just fine, but if you want some serious treatments that will slow the signs of aging and have you looking great, then you need to visit a medical spa in Fort Collins. While a regular spa offers aesthetic services like facials and massages, medical spas offer that plus injection services, laser services and even hormone replacement therapy. If you have ever wondered what a medical spa is all about, we can tell you. Lasers have become a very important tool in medical spas. They erase wrinkles and brown spots as well as remove spider and varicose veins. Laser treatments can also be used to remove deep scarring from acne and can zap out rosacea. In fact, there is a list of treatments perfectly suited for the use of a laser. Laser treatments are even used to get rid of your unwanted hair painlessly. One of the most popular and gratifying treatments you can get at a medical spa is skin rejuvenation. Skin rejuvenation treatments are used to restore your skin’s youthful appearance and give you that youthful look you once had. Treatments such as lace-lifts and chemical peels tighten loose skin, get rid of age spots and take years off your age. One or two trips to your medical spa will leave you looking 15 years younger and confident about how the way you look. And that is a great feeling. Health and wellness are always hot topics and there is always something new to try if you want to shed yourself a few pounds. There are any number of people who wish to lose some weight or want a way in which to get a better-looking body. The good news is that you can set an appointment with your Greeley medical spa to do just that. Medical spas offer treatments like body sculpting and skin tightening that leave you looking like a million bucks. Medical spas also offer advanced treatments that are aggressive, yet noninvasive. These treatments. actively reduce or correct the appearance of wrinkles and brown spots, treat acne and sculpt the body. You might want to consider setting an appointment with your medical spa if you have unwanted hair that you wish to have removed. Laser hair removal will get rid of that hair you don’t want with just a few treatments. In addition, laser hair removal is a low-pain procedure, nothing like what you have to suffer from waxing. Also, once the hair is gone, it is less likely to return. Derma planing is an exfoliating treatment performed using a scalpel to remove the outmost layers of your skin. Even though it sounds rather harsh, the treatment is painless and safe. This treatment will leave your skin brighter, smoother and will also remove hair. Microdermabrasion is a treatment that has been around for over two decades. It is a method of exfoliating or removing dead skin cells on the surface of the skin. Dead skin and the dirt and oil on your skin can cause unsightly complexion problems. 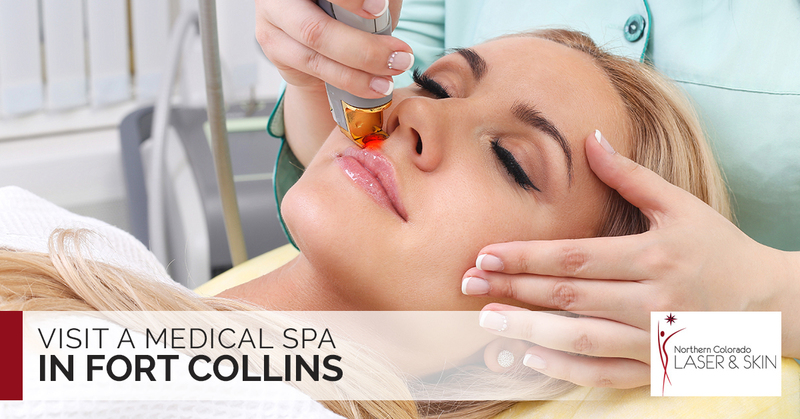 Microdermabrasion removes unwanted skin dead cells and stimulates the growth of new skin cells. The treatment consists of crushed diamonds and helps repair skin that has taken a beating from the sun and other environmental abuses. The diamond and can be used in sensitive areas including around the eyes and near the mouth. Lash extensions are a glamorous way to extend and thicken the length of your eyelashes. This treatment is an easy and convenient alternative to having to apply mascara every day. And while traditional false eyelashes need to be removed at the end of the day, Novalash extensions can be worn through the night. So there is no need to remove them before you go to bed. As you can see, there are any number of reasons to visit your Fort Collins or Greeley medical spa. Check out our services to learn more.